1964 the final basketball game in the East Chicago sectionals against Washington and a buzzer beater by Ken Mish 64-62. Bob Lamphier Class Of 1964! The Crown Point High School Alumni Association held its Tenth Annual Hall of Fame Banquet on April 06, 2019. The banquet was at the Saints Peter & Paul Macedonian Orthodox Cathedral, 9600 Broadway, Crown Point, IN. We are proud to announce the newest members of the Crown Point High School Alumni Association Hall of Fame. The four outstanding Bulldogs and the three outstanding Bulldog Teachers were enshrined into their respective CPHS Alumni Halls of Fame on Saturday, April 06, 2019. 2019 Indiana High School Girls Wrestling State Champion. First ever girl wrestling champion for Crown Point High School. Congratulation to the Bulldog Fall Sports Teams. Boys Cross Country – Regional Champs and 17th Place in the State. Girls Cross Country – 22nd in the State. Girls Volleyball – 2nd in the DAC. Boys Tennis – DAC and Sectional Champs. The following are a list of winners in the CPHS Alumni Scholarship Raffle -$1,000 -Carol Bangsberg; $500 – Robert Fogle; $300 -Jim Cuffia (who donated the money back); $100 – Bud Bowman (who donated the money back); $50 -Carl Weatherspoon; and $50 – Sydney Ellis. Congratulations to the winners and a GREAT BIG THANK YOU to all that participated. Officers and Board of Directors for the 2017-2019 term will be: Terry C. Lee, ’67, President; Ron Hampton, ’69, Vice President; Christine Arnold Lee, ’69, Secretary/Treasurer; Chester Rybicki, ’67, Board of Directors; Lynn Poulton Clay, ’67; Board of Directors; Charles “Bud” Bowman, Retired Teacher, Board of Directors; Kathy Foster, ’86, Board of Directors; Jeanann Georgas Freier, ’79, Board of Directors. Congratulations and Good Luck. Alumni Association Needs Your Help. Terry Lee, 314 Jodi Lane, Valparaiso, Indiana 46385 or call 1-219-921-9579. 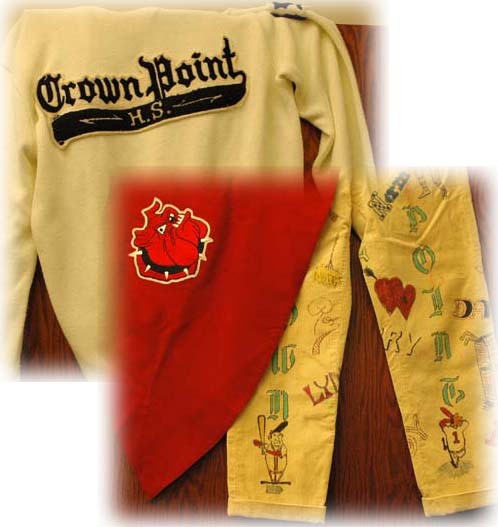 CPHS ALUMNI SHIRTS FOR SALE-White or Red Crown Point High School Alumni Shirts are available at MEMORY KEEPERS, now on Broadway across from Stracks. Present your Lifetime Membership Card and receive 10% OFF. Closed Sunday and Monday. We have also been cracking open the vault and looking for Crown Point High School memorabilia to display in the new high school! Please contact CrownPointAlumni@yahoo.com if you have any items to donate. The mission of the Crown Point High School Alumni Association is to develop and maintain a close relationship between Crown Point Community Schools, its constituents, and its alumni for their mutual benefit. The Association is committed to, and involved in, the support and well-being of Crown Point Community Schools and its alumni. All persons who have attended Crown Point Community Schools as listed by the registrar are defined as being alumni, and those who have taken part in the educational process at all levels, both faculty and staff, are defined as being alumni. To support educational programs through student scholarships, teacher grants and support of the Crown Point Education Foundation. To assist Crown Point Community Schools in communicating with its alumni. To convey to Crown Point Community Schools, the views, attitudes, and needs of the alumni in seeking to preserve, advocate and promote alumni interests. To honor alumni with "Portrait of a Graduate" Hall of Fame and Teacher Hall of Fame. To strengthen alumni activities and programs. To preserve and instill an appreciation of the history of Crown Point Community Schools. Please contact us with your news item(s) at least 2 weeks in advance to give us enough time to update the website. 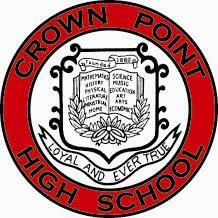 Click the Facebook Logo and become a fan of Crown Point High School Alumni Association. You will need to be a member of Facebook to become a fan. Please see Facebook for more information.